There are a lot of ways to create a spiritual successor to Nintendo’s classic boxing game Punch-Out!! 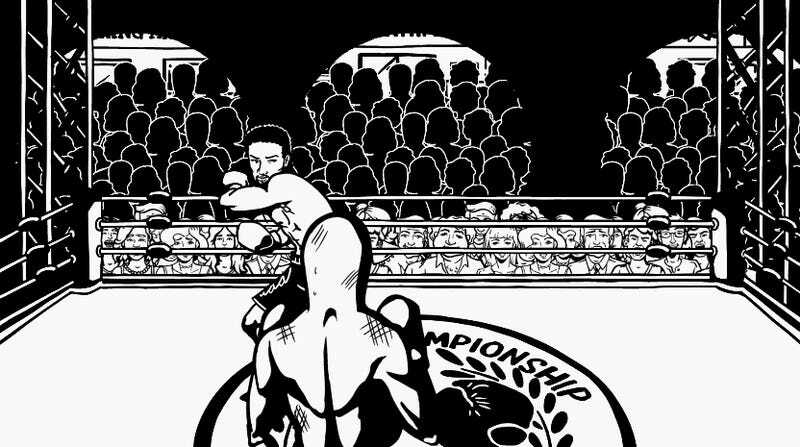 But Pato Box, with its black-and-white noir look, mechanic-laden bosses, and half-mallard protagonist might be one of the more unique ones out there. 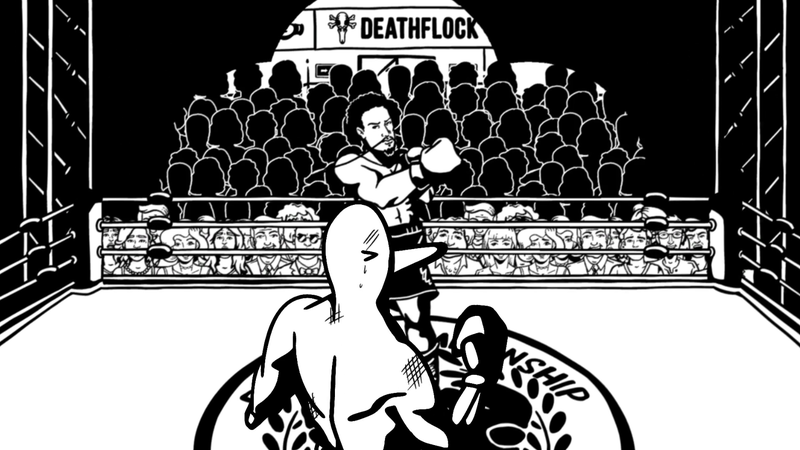 I’ve been really enjoying my time with Pato Box, gradually chipping away at its roster of pugilists. It feels very reminiscent of the best moments of Punch-Out! !, but brings some fresh ideas to the table as well. To start, it stars a duck-man who fights under the name Patobox. A true star of the ring, the game opens with you defending your title against fellow boxer Kilpatrick while someone slips something deadly into your water bottle. A gulp of water later, Patobox is laying face-down in an alleyway, stabbed in the back (literally and figuratively) by his employer, the enigmatic Deathflock. Just as things start to go dark, a mysterious figure saves Patobox and, an appropriate amount of time later, you’re at your former place of employment and looking for revenge the only way Pato knows how: in the ring. After a short intro section, the game is divvied up by the floors of the Deathflock tower. You’ll need the emblems of each member of the shadowy organization to open the door to the final boss, and you can only get them by beating them in combat. The controls are as simple as they can be. Patobox can dodge left or right, block, and jab low or high with either glove. It’s a two-button control scheme that feels right at home. The challenge comes in surmounting overwhelming odds with basic fundamentals, because your opponents do not fight as fair as your duck-billed boxer. An early boss fight pits you against the head of security, Ms. Brauch Enten. While she has some tricky swipes and strikes, she can also call in security forces to back her up during the fight. Lasers, tesla coils, and bunny-hopping robots will come at you, and you have to learn to dodge or deal with them to find openings against Brauch. Other bosses might fling a deadly soup at you, or you might have to box against a devious DJ setup. Of course, there are still chances to fight in the ring like a normal boxer, including against your rival Kilpatrick. The bosses are really inventive, and frankly, really tough. 15 seconds into the match, I had completely forgotten to keep that at the front of my mind. Several tries later though, it was firmly ingrained. Developer Bromio is thankfully lenient when you lose a fight, giving you a brief knockout animation and then dropping you right back at the start. If you’re like me, you’ll lose a lot, but you’ll learn in the process. In between the big bads of Deathflock tower are a series of minigames and obstacles to overcome. Like the fights themselves, these are lenient, but I found myself getting more frustrated in these sections. You can explore the areas in a slightly pulled-back version of the fighting camera, which is fine until you’re trying to be precise against instant-death environmental hazards. At a few points, I found myself ramming my head against the same series of obstacles. These exploration sections click better in areas like the casino, where Patobox has to gamble and earn enough chips to fight his rival again. Punching a roulette table or slot machine to bet is a fun gimmick. Yes, Pato can only interact with things by punching them, but Bromio has some fun with that in places. I’m still working my way up the tower, but Pato Box is unique and challenging enough to keep me going. Right now, I’m playing it on Steam with a Dualshock 4, which works just fine. The team told Kotaku via email that yes, a Nintendo Switch version is currently in the works for sometime this year as well. They’re also working on a boss rush mode with built-in timers, so you can work on beating your record against the game’s line-up. If you like boxing and aren’t afraid of things getting a little wacky, Pato Box is certainly worth checking out.